When you’re a true foodie, you want to share your best recipes and behind-the-scenes tips and tricks for making the best meals (or desserts!) in the world. And the same rings true for those that run a restaurant and want people to be able to book reservations, or have an eCommerce shop dedicated to selling cookbooks and kitchen products. 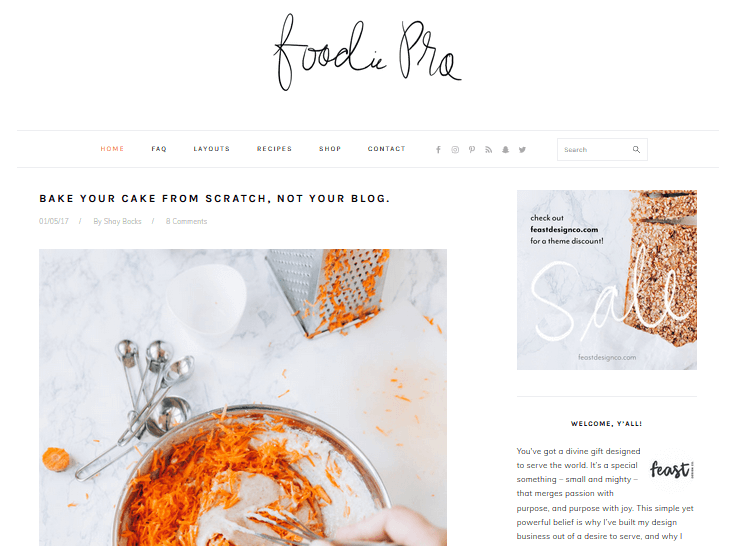 Whether you’re a food blogger or a startup foodie business looking to make it in the competitive food industry, you’ll need a solid recipe WordPress theme to help you achieve your goals. That’s why we’re here today to share with you the top recipe WordPress themes designed to give people with a true passion for food a creative way to express their thoughts, share their best dishes, and sell their favorite products with people who share the same love for food as them. 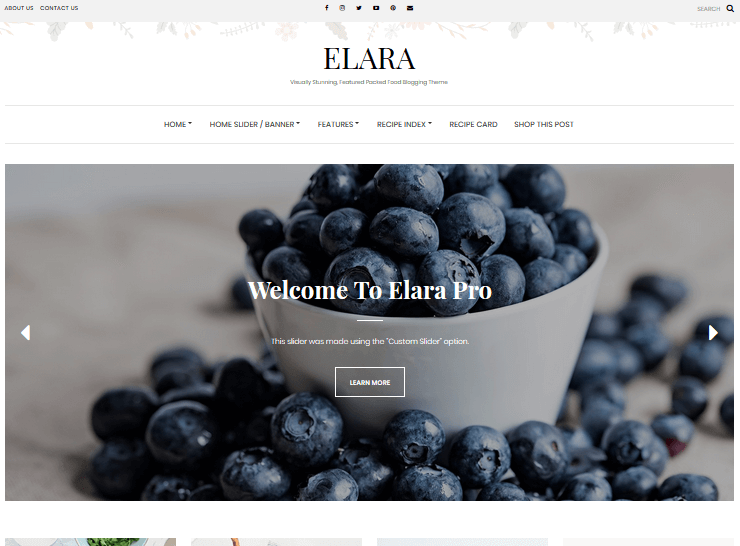 Elara Pro is a visually stunning recipe WordPress theme designed to give you all the features you need to start a food blog and monetize your site too. It comes fully responsive so your site looks good on all size screens and devices. In addition, it includes an impressive front page banner and slider, the ability to customize backgrounds and color schemes, and even comes with a built-in MailChimp form so you can build an email list and launch email campaigns to promote your growing business. This recipe theme also has features such as built-in ad space, a recipe shortcode builder for sharing your recipes with loyal readers, and front page featured posts so you can direct site visitors to your best content or products right away. 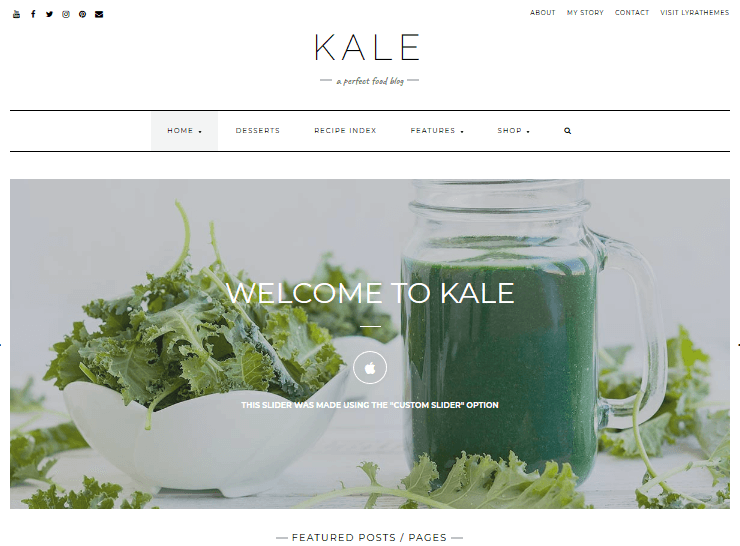 Kale Pro is another exceptional WordPress theme by LyraThemes that is designed to give foodies a great way to start a professional or personal food blog. It’s easy to set up thanks to the one-click demo import option, making it perfect for new website owners, includes featured posts for encouraging site visitors to read your best content, and includes video post formats for adding video content to your website, which can boost user engagement and increase sales. 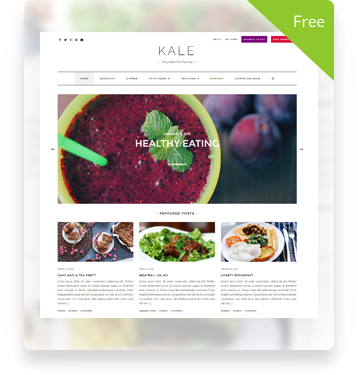 Additionally, Kale comes with special recipe index templates, custom fonts and color schemes, fixed navigation menus for the ultimate user experience, and a recipe shortcode builder so adding recipes to posts or pages is a cinch. 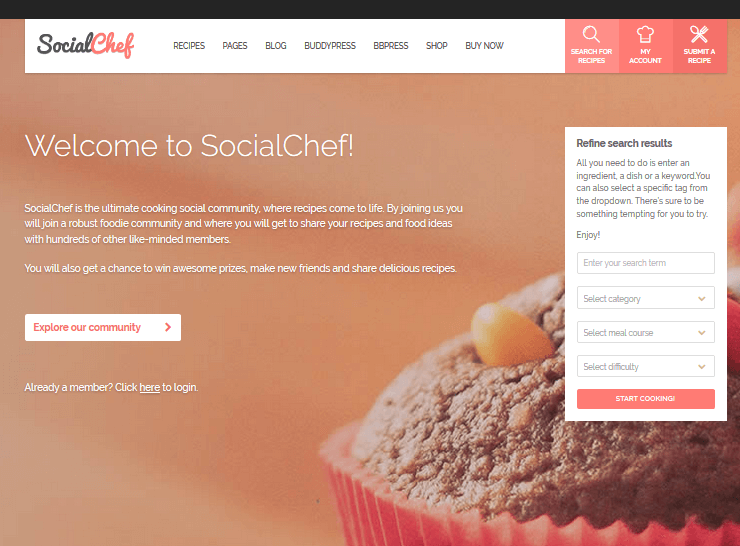 SocialChef is a fully responsive recipe theme, complete with frontend recipe submissions and community features such as forums, groups, member profiles, and activity feeds, all of which are great for building a loyal following. 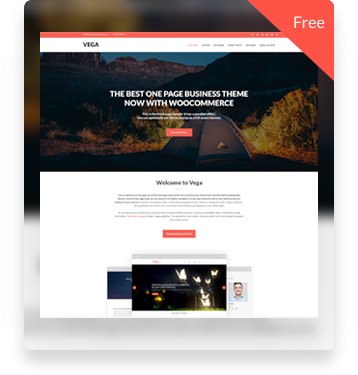 In addition, you can build an online shop by integrating with the popular WooCommerce plugin. That is, after branding your business with one of 12 color schemes. Lastly, display an advanced search box so site visitors can find everything they need, encourage social sharing of recipes, highlight a featured recipe and member profile, and add nutritional data into all of your recipes for those looking to create healthy, yet delicious, meals. Foodie Pro, built to work on the popular Genesis Framework, is what StudioPress calls the most flexible Genesis Theme to date. It;’s full of features like customizable color schemes and font types. It’s also mobile-friendly and comes with 3 homepage options and 5 sitewide widget areas. Not to mention you can upload a logo in the header. Rest assured your fellow foodies will be able to find your recipes using the extensive search function, will enjoy your beautiful images, and will be rushing to test out your featured recipe. 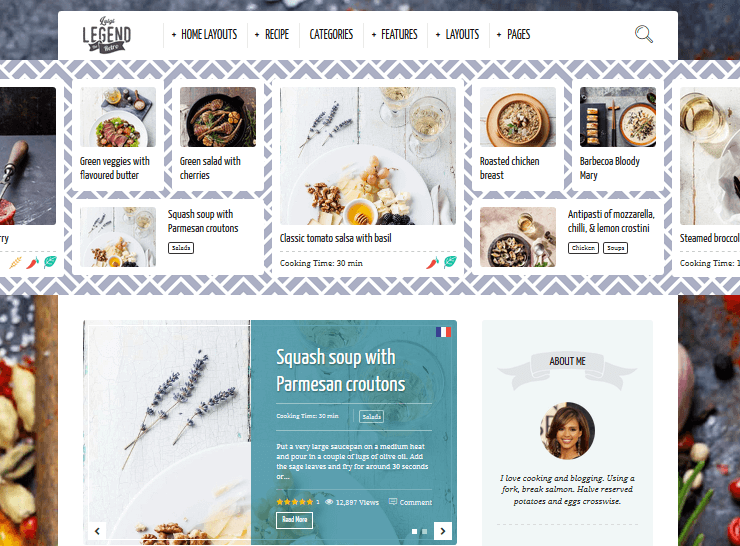 Neptune is a recipe WordPress theme that aims to bring together a community of like-minded people that share a love for cooking and sharing recipes. Let site visitors search based on things like ingredients and nutritional information, create multiple recipe steps for people to follow, and don’t forget to add images. In addition, you can enable the review and rating systems to people can weigh in on the featured dishes and the bookmarking feature so people can always come back to the recipes they love most. This foodie theme also comes with built-in social sharing, recipe author pages, SEO optimization, and 10 unique layouts for recipes so your website always stands out from all the rest. Food & Cook is ideal for those looking for a blogging platform that caters to the food industry. It comes with 6 homepage layouts and 3 unique recipe layouts, so creating content that looks good and engages site visitors is easy to do. You can also build an online shop using WooCommerce for selling cookbooks, kitchen utensils and appliances, and possibly even cooking lessons if that’s your passion. Plus, embed video content onto your site, let site visitors submit their own recipes, and customize your site using the unlimited colors available. Lastly, install demo content to get you started, use the built-in Revolution Slider for showcasing images and cooking steps, and even use some of the 50 shortcodes for improving the overall design and functionality of your food blog. And there you have it! 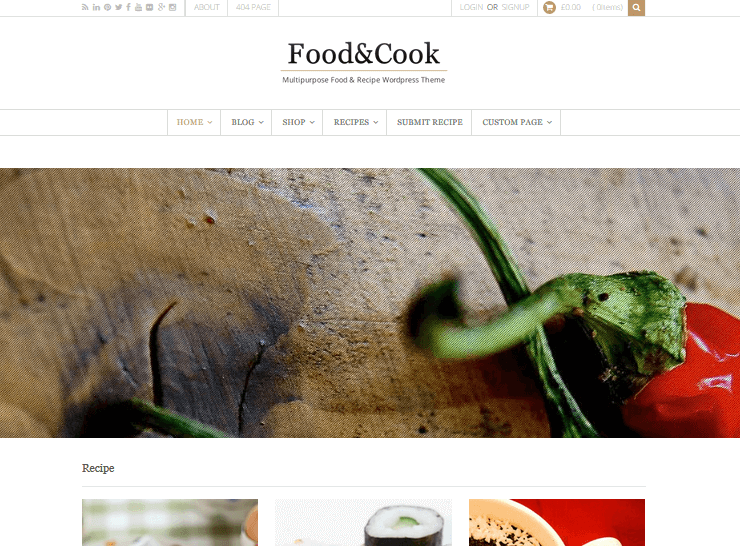 Seven of the very best recipe WordPress themes on the market today designed to give you the perfect platform for creating a foodie blog or online shop, complete with top-notch recipes, kitchen utensils, and cookbooks. 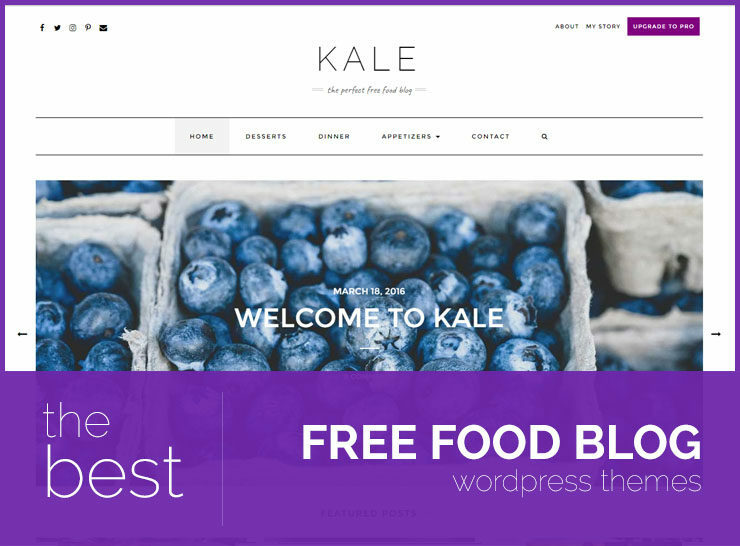 Here are some great free food blog themes that you can use to create a food blog. If you’re just starting off your blog, you may want to test the waters before jumping all in. That’s where free food blog themes for WordPress come in. 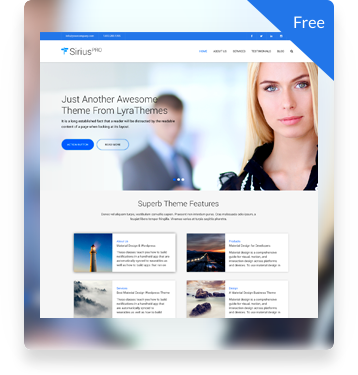 You can try a theme before purchasing its premium version or switch to a completely different premium food blog theme after you build a good online presence with a free theme. We’ve painstakingly reviewed and collected some of the best restaurant WordPress themes of the year. 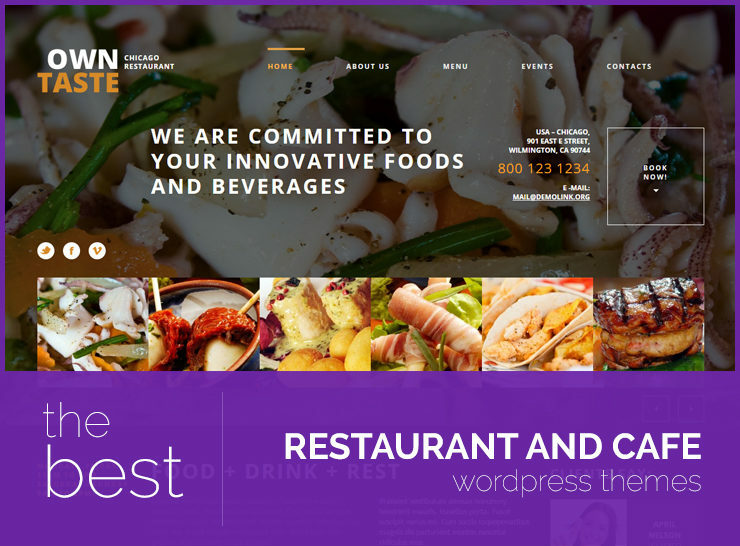 These are extraordinarily stunning, aesthetically clean, and extremely customizable WordPress themes that are specifically designed and developed for restaurants, cafes, bistros, donut shops, wineries, bars, diners, and other eating establishments.